Anniversary Spring . . .
Six (6!) years ago the concept of “Wildflowers of the West Village” conceived in liberty an ongoing mission to serve History. The best is, as the rest, and seeks out to answer what untended wild exists on the western edge of Manhattan during the early twenty-first century. Report as a journalist: craft, ethics, objectivity. Write as a poet within the standard prose traditions of Natural History. The fact the flora explorations offer exercise at whatever fitness level one desires has extended and sustained a silver lining to my distance running life for two score plus of years. Spring Equinox 2016 gusted in near 12:30 a.m. EST with preparations readied for a citywide snow storm that arrived only as brief periods of spritzing sleet. The predominant weather pattern has remained bluebird skies, sun bright, almost white, the atmosphere blowing on strong sustained winds. Some outings may be more of a hike than a run. Sometimes both are combined for various effects. Spring time gives the city good air before the pollen count commences, great times to be out of doors. Full sun bathed one such exertion combo around the leafy stretches of NYC’s parks. Marshy areas call for lighter stepping. I attempt to not even leave footprints. A drier winter has left marsh in place under a dry intact leaf carpet in most areas. One spot of perhaps an acre did stand out as wet as expected. Brush nested in oak leaves, which received sun later in the afternoon. Within that section there rested a spot near a tannic puddle bottomed in saturated oak leaves. 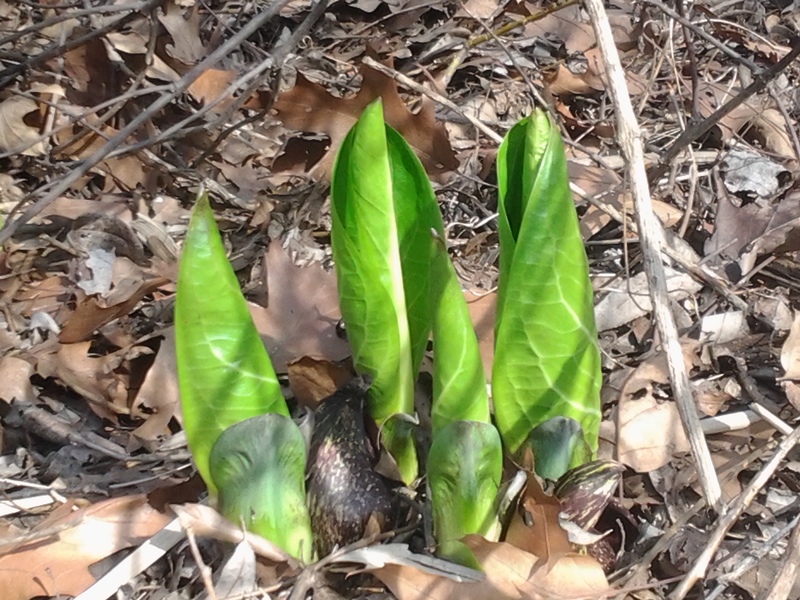 Nearby stood distinctive green candle flame spires rooted in a patterned purple almost ceramic in appearance; there the new green shoots of the soon to be enormous Skunk Cabbage, Symplocarpus foetidus. Sighted often on spring hikes, near the water waded in search of trout, some enormous verdant “verde” ears may be seen by early April. Fly fishers may take note stoneflies and bees are attracted to the plant, inedible and indelicate of odor to most humans. The health and vigor and native green this species gives to one’s eyes a fresh bloom to the picture; a kind of green quotation to the predominant three brown, white, and blue. Skunk Cabbage could just as easily be called Woodpecker Cabbage, or Trout Cabbage, given its time of emergence and the other active living species gathered and about around the days surrounding the Spring Equinox. 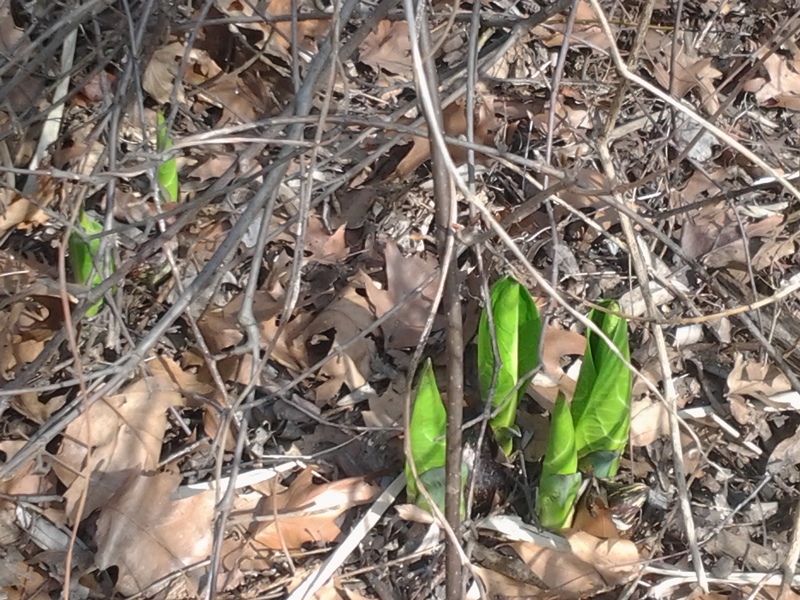 Symplocarpus may be NYC’s first native thumb up for another growing season, perhaps like a first tuba in spring’s unfolding symphony of green. Skunk Cabbage takes its place with all the other wildflowers of the West Village, and beyond. Happy 6th Anniversary, Wildflowers of the West Village. Spring, 2016.